The Roberts Radio CD Cube is a 3-band stereo clock radio with dual alarms. You use a buzzer sound, the LW/MW/FM radio or the CD player as an alarm clock. This radio was first released over 10 years ago now, and it doesn’t offer DAB radio. The Roberts CD Cube doesn’t remember which radio station you were listening to when you switch it to CD mode and back. You also can’t save preset stations. The main reason for buying the Roberts Radio CD Cube is having the combination of AM (LW/MW) radio with a CD player and an alarm clock. There are many newer FM/DAB alarm clock radios you can get that have better sound quality and reception than this model, so its main selling point is the CD player and having LW and MW bands. If you’re looking for a clock radio, we’d recommend considering one of these alarm clock radios. 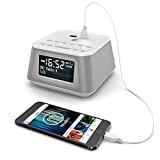 A cheaper alternative to the Roberts Radio CD Cube is the Madingley Hall DAB Bedside Digital FM Radio , which is an FM/DAB alarm clock radio with two USB charging points for charging a smartphone or other device. You can also check out our roundup of the best radio CD players.